The swaths of vacant and abandoned land at the southern end of the city near Green Hills Market seems like a logical place for the streetcars to rest at night and be repaired as necessary -- a nexus that provides jobs and serves as the heart for the entire system. Green Hills is a natural southern terminus for the line as it can provide access to fresh foods for people living along its route, and the nearby parking lots allow for park-and-ride from the nearby neighborhoods and suburbs. Traveling northward, the streetcar line provides a commuter option for much of the South Valley and makes stops at important recreational facilities such as Meachem Field. The streetcar reinforces a well-traveled bus line through the south side, but with its regular schedule [ideally, one passing no less frequently than every 20 minutes] it would spur retail in the storefronts along its route in a currently under-served area. Nearing downtown, developers would have interest in constructing mixed-income housing on vacant land along the line as it provides attractive and easy access to the central business district. Landmarks such as the Sears Building would be restored and once again become icons in their neighborhoods. The downtown segment would offer closer stops and likely be the most-traveled amidst the city's many landmarks, apartments, shops, and cultural institutions. A connection at the newly constructed CENTRO hub would allow for transfer to the entire regional bus system. Farther north, transfer to and from the Connective Corridor route allows for easy travel to the student- and employee-rich University Hill and the burgeoning Near Westside. The streetcar would be a draw for tourists visiting downtown, and would allow them to easily access other areas of the city. The route continues up North Salina Street [into Little Italy], a stretch of many walkable blocks rich with old storefronts and mixed-use buildings that are ripe for investment. The streetcar would naturally make them desirable investment opportunities, and energy form downtown could be drawn up this corridor. One block off of North Salina in either direction exists some of the densest neighborhoods in the city -- the kind of places where it makes a lot of sense to have access to the streetcar system and live a life less dependent on an automobile. Nearing the northern edge of the city, the line jogs over to Park Street, passing through a cluster of warehouses at the Wolf Street stop -- a Franklin Square-esqe neighborhood waiting to be born. At the regional market, another source for fresh foods, the streetcar jumps onto existing track that loops around to connect to the stadium and ultimately the regional transportation center. I need not say anything about how desperately the stadium needs better access from the city at large -- just imagine hopping a train before or after a game to Armory Square to grab drinks or dinner. The transportation center is another resource in dire need of connection to public transportation, both for people arriving and departing, as a taxi is pretty much the only option right now. People arriving would have easy access to downtown hotels, and, for example, SU students would have direct access to the buses and trains back to their hometown during breaks. Lastly, in the future, the route could be extended northward on an express route to Onondaga Lake Park and the Village of Liverpool. Onondaga Lake Park is nicknamed the "central park" of the county, and should be easily accessible to those living in the city. The Village of Liverpool is dense enough that it could support a commuter ridership into the city, and again, the streetcar would be a catalyst to development along its entire length, including in the Village. love it. and it looks much smoother than my poor attempts of mapping out a light rail system on my computer in years past. what's cool about your design is that it centralizes it along salina street thereby focusing on commerce along the route. this would actually solve quite a few problems with the immediate area - especially salina street which needs all the help it can get and has a huge amount of untapped potential leftover from the mid 20th century. unfortunately due to poor planning mistakes, the stadium and transportation center (and to a further extent, the mall) feel like they're in an entirely different region than the central city. this covers up the mistakes a bit from both directions. 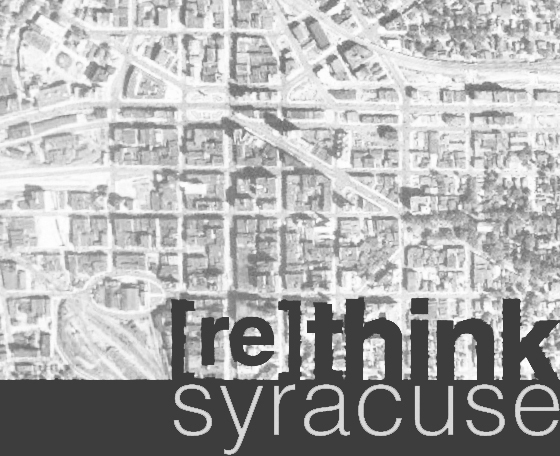 southbound, the "tourism" by amtrak and greyhound may not be huge, but syracuse has been missing out on showing at least a small percentage of these people what the vibrancy of downtown life and the immediate area is really like. a simple train ride could solve this to where they could easily hop on and go see a few places of real value for a few hours (as oppose to sitting in a small bus station underneath a highway in the middle of nowhere). plus the north/south route makes travel easy for anyone to comprehend, even if they're new to the city. northbound, it connects the southside residential areas to the baseball stadium, links the regional market to armory square (which then links to the creekwalk), and ties the connective corridor with the main parts of downtown. maybe it would cost a lot of money to construct, but the investment would be well worth it. especially with possible expansion. great work. Thanks, Josef, and excellent points. A Salina St route has the potential to connect so many disjointed points in the city, and would certainly call attention to all the commercial and mixed-use buildings along the route, spurring a wave of infill and re-energized existing buildings and spaces. As you mentioned, that potential needs to be tapped! As for the stops along the route, the street car would only stop if someone is waiting or if prompted by a rider, much like a bus currently operates. The stop locations are merely suggestions, based on adjacencies and a roughly 5-minute walking radius.